WILDCRAFTING #2: MUGWORT, (bonus plant Wormwood), YARROW AND RED CLOVER. And a little conversation with God and St. Francis on Lawns. 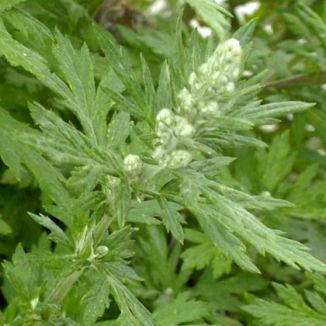 I have to tell you Mugwort and Wormwood are very close. They are related and they are both good herbs to wildcraft. So here is a pic and description of Wormwood. Two for the price of one. 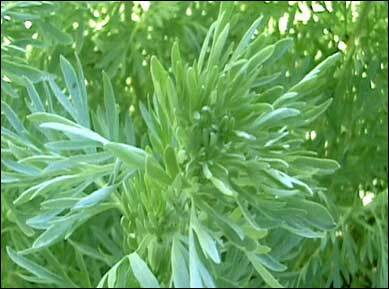 The leaves on the wormwood are more deeply lobed and more of a silvery color than the mugwort. Wormwood is a great find and has quite a history. 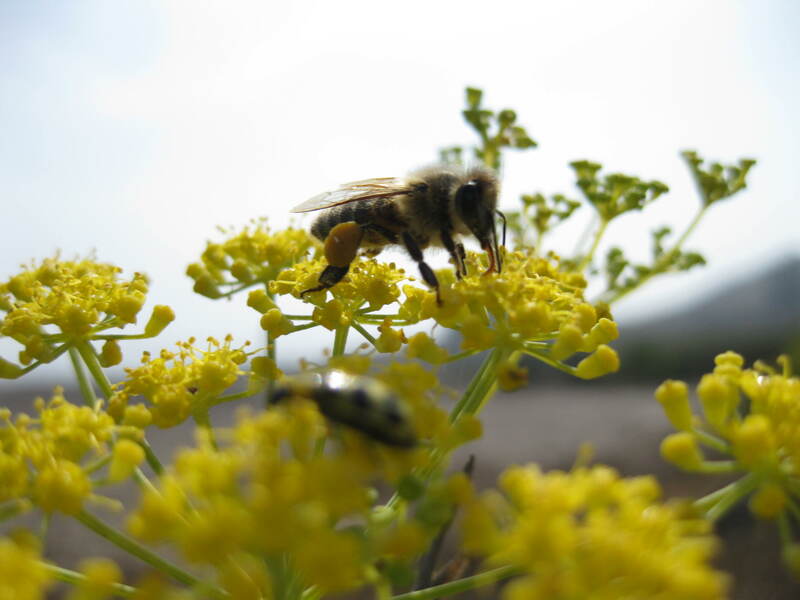 It is one of those biblical herbs as is fennel and yarrow. Yarrow comes in pink, white and yellow. 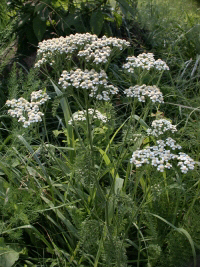 A reader was nice enough to point out that the white yarrow and not the yellow as I had originally posted, is the native. Good to be able to set the record straight. Thanks Judith. Native yarrow is very prolific and reseeds itself almost desperately which is good because there is so much you can do with it. I just learned you can take one leaf, chop it up and put it on your compost pile to speed up decomposition. Works so well with other herbs too. 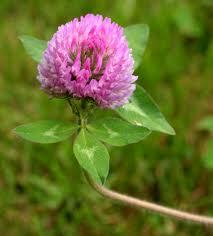 You can find red clover everywhere. Red is really pink and there is a white clover but the medicinal properties are different. It also reseeds itself and is, as is with all clovers, great for the soil. All the herbs I have mentioned here that are so beneficial and part of the wildcrafting art are regarded as weeds by the makers and producers of lawns. Ortho and Scotts have weed killers to protect the precious over pampered, waste of space we call lawns from the likes of Mother Nature. Topical treatment (such as for psoriasis or eczema): an infusion, liquid extract, or ointment containing 10 – 15% flowerheads; apply as needed unless irritation develops. Do not apply to an open wound without a doctor’s supervision. As you might guess I am not a fan of lawns. I am sorry. They are nice to look at when they are all green and manicured. As a kid I hand mowed about a quarter of an acre of lawn every week which I actually enjoyed doing. I don’t like lawns because I think today they are a colossal waste of time, money, water and effort. Josh, #2 son, sent this to me about a year ago knowing how I feel about lawns. This is right on and what we call garden humor. Enjoy. See you next week. Will be doing dandelions and two others. I wondered about the old adage, “The truth hurts” and asked myself what does that mean? How can the truth be a bad thing? I pretty much decided that facts are about as close to the truth as you are going to get. Or perhaps the certainty of numbers are very close to an indisputable truth. I mean 1+1 for all intent and purposes is always going to = 2. So, who is hurt by the truth? I think honest persons can not be hurt by the truth. Tell an honest person the truth and they will appreciate knowing it. However, tell a person who knows the truth and covers it up with an intent to deceive and you have someone who would be exposed for lying about the truth and that would hurt. I don’t have any idea of where all that came from. All I know is, that is what you get when someone says, We need something up and we need it up quick. So there’s quick. Watch the trailer and tell me who you think is telling the truth and who you think is lying? And why. Also if you want the latest GMO news this is it. Even better news. How to Fight the Good Fight and win. P.S. Added Feb. 10,2010: Huffington Post publishes the 12 most unethical companies in the WORLD. The worst of the worst. Too delicious. I am not an I told you so type person but I TOLD YOU SO!!!!!! P.S.S. Studies link GMOs with toxins, allergies, infertility, infant mortality, immune dysfunction, stunted growth, accelerated aging, and death. Whistleblowers were fired, threatened, and gagged. Warnings by FDA scientists were ignored. Expert Jeffrey M. Smith, author of the #1 GMO bestseller Seeds of Deception, and Genetic Roulette, presents SHOCKING evidence why these gene-spliced crops may lead to health and environmental catastrophes. Learn how to protect yourself and discover the Campaign for Healthier Eating in America—a brilliant plan to quickly end the genetic engineering of our food supply. We will continue our regularly scheduled blog next week. Ciao for now.